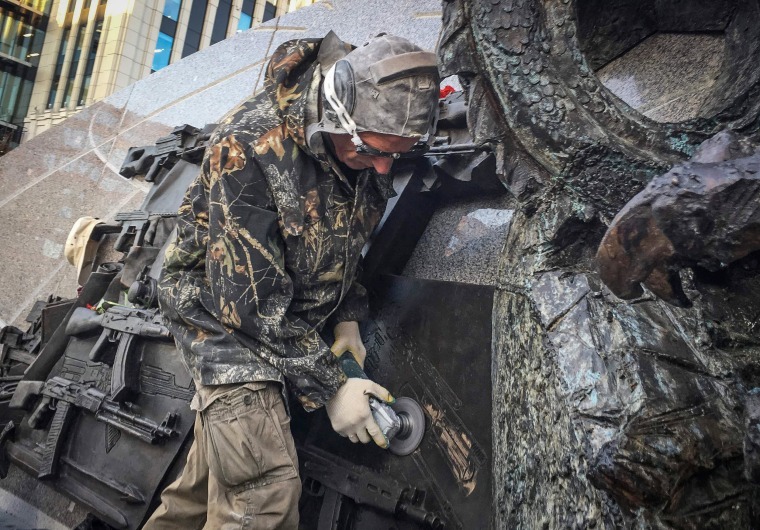 MOSCOW — Workers on Friday cut out part of a new monument to Mikhail Kalashnikov, inventor of the Soviet Union's legendary AK-47 assault rifle, after eagle-eyed Russians noticed that it mistakenly depicted a German weapon of World War II. Just three days ago, the monument to the creator of one of Russia's best known export brands was unveiled with much fanfare in central Moscow. A metal bas-relief behind a statue of Kalashnikov depicts the AK-47 and other weapons all supposedly designed by the engineer, who died in 2013. But on Friday, embarrassed sculptor Salavat Shcherbakov had to admit that among them was the Sturmgewehr 44 (StG 44) assault rifle used by Nazi troops at the end of World War II. "We will rectify this," Shcherbakov said in comments broadcast by state-run Rossiya 24 channel. "It looks like this (mistake) sneaked in from the Internet." By Friday evening a square hole gaped where the German rifle had been depicted in the bas-relief. Kalashnikov's weapon, created in 1947, does have a striking resemblance to German arms designer Hugo Schmeissers's StG 44 rifle, created in 1942, although they have major design differences. Kalashnikov was known to have said he had heard speculation that he had copied the German rifle. Vladislav Kononov, executive director of the Russian Military and Historical Society, was cited by Russian media as saying that the fact that angry Russians had spotted the error in the relief disproved that. Many had earlier vented their disapproval on social media. "Every cloud has its silver lining — thanks to this mistake ... a myth has been destroyed that Kalashnikov borrowed some elements of his invention from his foreign colleagues," he said. The AK-47, the small-arms mainstay of Russia's armed forces for over 60 years, is called by some experts the most effective weapon ever made.